Davenport, Evans, Hurwitz & Smith, LLP is celebrating the firm’s 80th Anniversary. 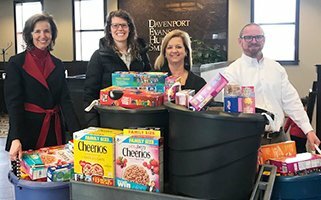 The attorneys decided one meaningful way to celebrate would be to give back to the community through donation of 80 items to a different non-profit each month in 2019. Check back to our News page for more updates on the Davenport Evans 80th Anniversary “Giving Back” project.